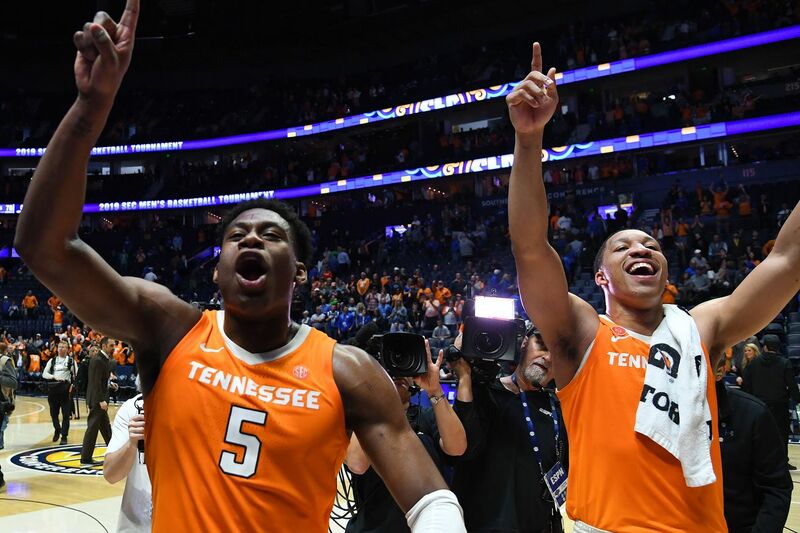 Tennessee’s SEC semifinal win over Kentucky led to some shuffling on the bracket’s top line, with more potentially to come. At the other end of the bracket, a trio of potential bid snatchers saw their runs end this afternoon. We’ll start this update at the top of the bracket where there’s been some shuffling on the top two two seed lines since Saturday morning. That’s thanks in no small part to the Tennessee Volunteers’ 82-78 SEC Tournament semifinal victory over the Kentucky Wildcats (and yet another round of number-crunching on my part). At the moment, the top two teams in the field of 68 come from the ACC, with the 29-3 Virginia Cavaliers first overall (atop the East region) and the 28-5 Duke Blue Devils second (anchoring the South). Tennessee jumps all the way up to the third spot (leading the Midwest), with the Gonzaga Bulldogs fourth and anchoring the West. The No. 2 seeds are the North Carolina Tar Heels, Kentucky Wildcats and a pair of teams who happen to meet in tomorrow’s Big Ten Tournament final, the Michigan State Spartans and Michigan Wolverines. The Selection Committee won’t have an easy choice in determining the final two No. 1 seeds. Here’s a breakdown of what I considered in making my current projection. Virginia is at the top of the NET rankings and is tied with Michigan State for the most Quad 1 wins in the country, with 12. The Cavaliers go to the top as a result. Duke is only third in the NET, but is 10-4 in Quad 1 games with the second-ranked strength of schedule nationally. Plus, they seem to be back to their world-beating selves with Zion Williamson back in the fold, even if Marques Bolden is still out. The Blue Devils are second for now. Third is where things start to get tricky. Tennessee gets the nod even though the Volunteers are outside of the NET top four (ranking sixth as of this morning). But a pair of wins over Kentucky and that December 9th head-to-head victory over Gonzaga gives them the edge at the moment. However, if Tennessee loses to Auburn in the SEC Tournament final tomorrow, it could drop again. Finally, Gonzaga is fourth, even with a road loss to North Carolina (a game Killian Tillie didn’t feature in for the Bulldogs). The Bulldogs are second in the NET, which will probably sit well with the Selection Committee. However, one comment made by Committee chair Bernard Muir after last month’s bracket sneak peek may lead to some worry for Gonzaga fans. Gonzaga got the fourth No. 1 seed based largely on the teams they’ve beaten and the quality of the opponents they’ve lost to. The Bulldogs’ stunning Tuesday night loss to Saint Mary’s currently ranks as their worst loss. But the Gaels entered today at 32nd in the NET. Meanwhile, North Carolina’s worst defeat came to 38th-ranked Texas (oddly enough, on the same Orleans Arena floor that’s the site of the West Coast Conference Tournament), Kentucky has two sub-50 losses and Michigan State lost to 109th-ranked Illinois. So, I’m keeping Gonzaga on the top line based on the Committee’s guidance. Now, North Carolina could end up as No. 1 either at the expense of Gonzaga or in the event of a Tennessee loss tomorrow. The Tar Heels do have those two wins over Duke, even if those came without Zion Williamson featuring for the Blue Devils. Plus, I can’t help but think the Committee won’t punish UNC too much for losing by a single point to Duke with Williamson playing. To further complicate matters, if Duke defeats the Florida State Seminoles in tonight’s ACC Tournament final, the deliberations over whether to place the Blue Devils or Virginia No. 1 overall will be fascinating. Down by the cut line, the teams waiting to hear whether they’ll earn one of the final at-large spots got plenty of good news this afternoon. In the American Athletic Tournament, both potential bubble poppers were eliminated, as the Houston Cougars held off the Memphis Tigers, 61-58, and the Cincinnati Bearcats edged the Wichita State Shockers, 66-63. The Mountain West will also not place a surprise team in the field, as the Utah State Aggies impressed in the second half on their way to knocking off the San Diego State Aztecs, 64-57. So, the picture near the cut line looks almost exactly the same as it did this morning. But there’s still the possibility for bubble drama, as the MAC’s top seed, the Buffalo Bulls are currently playing the Bowling Green Falcons in that conference’s final in Cleveland. Then, later tonight, the Oregon Ducks will hope to knock off the Washington Huskies (10:30 p.m. ET, ESPN) to secure the Pac-12 title and possibly a third bid for that beleaguered conference.